The PM 5415 and PM 5418 multi-system color TV pattern generators are used for test and measurements, and maintenance and repair of video equipment, such as color TV, black and white TV, videocassette recorders, teletext/Antiope receivers, video monitors, and cable TV equipment. Applications for pattern generators are found in development, production, quality control, and educational areas and in TV studios and service workshops. The instruments cover the complete RF frequency range from 32 MHz to 900 MHz. They operate according to the CCIR or RTMA TV systems for either PAL or NTSC respectively. PM 5418 also offers SECAM. The 18 basic test patterns and over 100 different test pattern combinations are selected via the PATTERN keypad. The patterns cover current and future purposes. Every test pattern is available in 16:9 and 4:3 Aspect Ratio format. The microprocessor control enables simple and rapid operation; it also allows a program sequence to be stored and recalled. 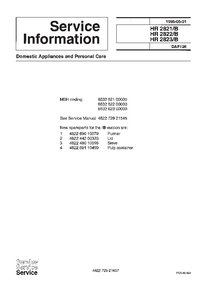 Up to 10 instrument setups may be stored in nonvolatile registers; they can be recalled in any order. Each program may contain RF vision frequency, test pattern, or a combination of patterns, as well as any of the sound operating modes. On PM 5418, the TV system is selected via the PAL/NTSC/SECAM key and two thumbwheel switches on the rear panel of the instrument. 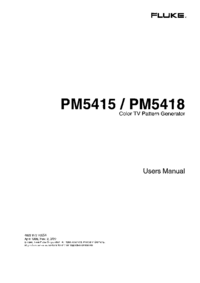 On PM 5415 the TV system is selected by the PAL/ NTSC thumbwheel switch. 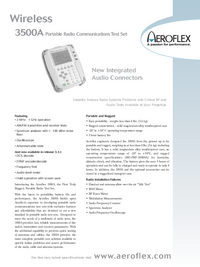 The line frequency is automatically selected, either 15625 Hz for CCIR or 15734 Hz for RTMA. Line and field synchronization are determined according to the appropriate TV standard and are available as line and field frequency for external applications at the BNC connector at the front panel. A part of the vision carrier section consists of a 4-digit LED display. The first digit indicates which of the selectable memory registers are in operation. The second, third, and fourth digits indicate the vision carrier frequency in MHz. Fine adjustment of the frequency setting in increments of 0.25 MHz, 100 kHz steps in the lower frequency ranges, is done by pressing the up and down steps keys near the display. LEDs indicate the selected value. Frequency tuning through the RF range is done by holding one of the step keys. Keys for STORE and RECALL allow operation of the memory. The RECALL facility can also be used in combination with the step function to move swiftly through the sequence of stored information. The VIDEO OUTPUT is 1 V standard in stop position; it can be set from 0 to 1.5 V. The CHROMA amplitude is fixed to 100 % in stop position; it can be set from 0 to 150 %.